Alice Svensson first became known to Swedish audiences in 2008 when competing on Idol (the Swedish subset of the global Idol franchise) in which she finished as runner-up. Just a teenager at the time, Svensson worked steadily for a couple years releasing before all but disappearing entirely from the public scene. Now she is set to make her comeback in Melodifestivalen, though not without a bit of rockiness as she has been placed second in her semi-final running order in which other big names such as Loreen and Jon Henrik Fjällgren will be competing. "At first I was a little bit disappointed too, but now when I've been thinking about it, it [doesn't] bother me anymore. What's more important is which song is before me and which song is straight after my performance. I think I'm in a pretty good position anyway because Jon Henrik's [song] is a little bit more calm and also Les Gordons, the performance after mine, is also a little bit more calm. I think it will be a great spot for the song." Svensson begins our conversation by taking us through what she has been up to during her hiatus from releasing music, and why she took the time off at all. "First, I was working really, really, really hard after the Idol thing. I was working for almost three years in Sweden. I did a lot of work and then I was like, 'I'm still just eighteen, nineteen. Is this really what I'm supposed to do for the rest of my life? What if I'm really, really good at something else?' Like every other teenager in the whole wide world, I was questioning myself. So I went to my record label and I said, 'I want to do something else. I want to try learning how to write, I want to try finding another direction with music, maybe being a better vocalist or something like that, I just need something else.' They were like, 'Okay, you've got time. You're so young, it's okay. You don't have to hurry, you don't have to do things you don't want to do or things you don't feel comfortable with.' I didn't run away... but kind of. So I just had a break and went to America for a couple of months at first. First, I just visited LA. LA wasn't my thing. It was really, really nice and that's where I began to start learning how to write and produce and all of that. I was so bad. I was really, really, really bad at that at first. So I went back home and tried some other things. When I felt a little bit more safe and grown up, I went to Florida. I loved Florida, it's so nice. It's still like my second home. So I went to Florida for a couple of months, back and forth. When I came back, my A&R Robert, who's amazing here at Warner said, 'Okay Alice, I think you're ready now. How do you feel about going to Anderz Wrethov and writing some music together?' I love Anderz Wrethov." 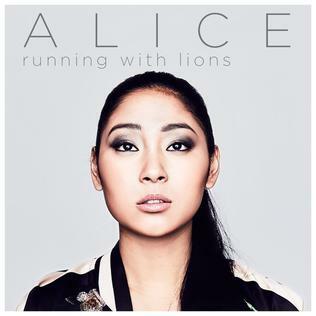 Her collaboration with Anderz Wrethov led to the creation of her Melodifestivalen entry, "Running with Lions", which has sent fans reeling from all the speculation as to what such a dramatic song title suggests about how the song will sound in full. "This is very dramatic. It's more like, all the things that I've been learning for the last years during my trips and during all these sessions with amazing people that I've been given the chance to work with, I've just been taking it all and put it with Anderz into this song. I'm really proud of it, it's really good. We also wrote the song with two other guys. They are more kind of house and country people, so this is their first time in Mello too. It's really, really, really exciting. We are three people on this song that have never done Mello before." Svensson says that the song is still a pop song, and that her musical style has not left pop from the time she began releasing music. However, her style has evolved in some ways as she has matured. "The older you get, the pop that you're performing with and the songs that you're writing needs to have something brighter for every year that you grow older. It needs to be deeper, smarter, and a little bit more grown-up. It's still pop but it's got influences from organic music, the dramatic things, I really like the more old-school pop. Not that mousey, but pop with influences from soul or R&B. I'm excited because I don't think there has been any other song like this in Mello this year." Another alumni from Idol 2008 is Robin Bengtsson (who finished third behind Alice), will also be competing in this year's Melodifestivalen after having great success doing so in 2016. Additionally, the winner of that season, Kevin Borg, has been announced as a competitor in Malta's national selection for the Eurovision Song Contest. "It's so weird! I'm actually a little bit sad that me and Robin [aren't] in the same [semi-final] because it would have been so much fun. But at the same time, I'm really happy that I'm not competing against him in the first [semi-final] because he's really good. When I confirmed my performance in Mello, I was pretty sure that Robin was going to come back too because he did really well last year but it was a shock for me that I might still have a change [to beat] Kevin. I would love that! I've been waiting for so long to have this revenge on him. Because I was so young, so I'm more like, 'Okay. Let me show you what I got now.'"